The idea behind hydroponics can be a bit confusing at first. This is especially true if you are a novice in gardening. Like how can you grow crops without soil? Is it really possible? Especially when you’re trying to build the best hydroponic system. The best hydroponic system for growing up crops using water nutrients will be presented further. Here you skip good old dirt and go with nutrient-rich solutions. This method is known to be effective in increasing yields. The plant’s root system is held in an inert medium like Rockwool, vermiculite, peat moss, perlite, or clay pellets. The system works in that the plant can access the nutrient solution and still get its fill of fresh air. Reservoirs– this is the container which stores the nutrients solution. It is fed with pumps which go in and out to connect with the growing chamber. It is essential in providing the correct amount of fresh air and nutrients. It is also supplied with timers to control the elements for growth. 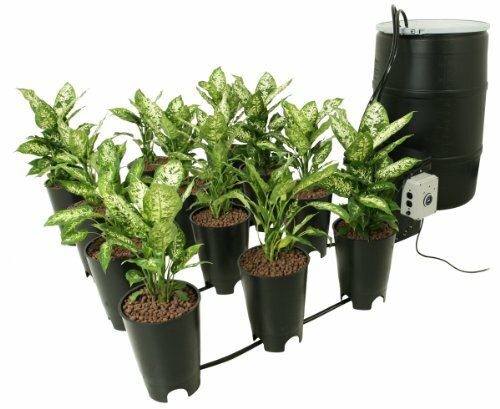 Hydroponic Nutrients– look for fertilizers that are unique to hydroponics. Grow Lights– these are lamps that simulate the sunshine for the photosynthesis process. You should invest in quality lights like LEDs or HIDs which supply light in full spectrum to provide proper lighting throughout the crops life cycle. Timers– these are crucial in controlling when the plant gets its fill of water. It ensures no excess is in the plant tray by pumping it back to the reservoir. Also, timers are essential for the grow lights and airflow. They also manage other aspects of ventilation and cooling systems. Trays/net pots– it’s the location of the plant on the reservoir. Grow Tent– where will you hold all your plants. Invest in grow tents which reflect back light so that it can reach every crop. pH Testers- your solution has to be in an optimal state for your plants to thrive. It should not be too acidic or too alkaline. pH level best preferred for weed is around 5.5 to 6.8 so be sure to maintain it at that. Most preferred and hands down the easiest method of growing crops using a hydroponics system. 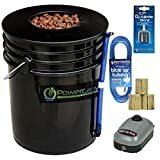 You’ll need just a few items to set up your hydroponics. The best thing about this system is that it is very inexpensive and people can even make it at home. You’ll not need to maintain it all the time, and you can reuse it over and over again. However, it limits on plants with a short life cycle where the roots do not grow so deep. 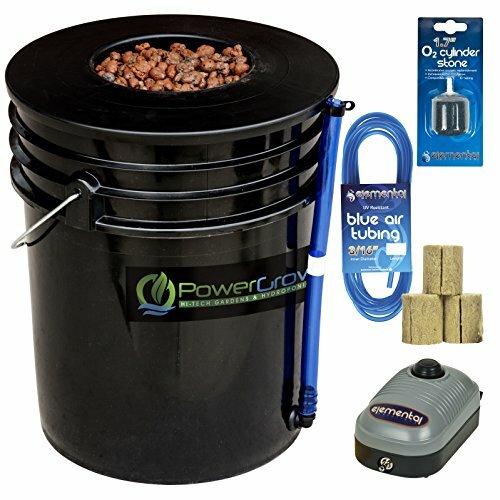 For those who are starting out, the PowerGrow Systems DWC Hydroponic Bucket Kit will work best. You don’t need to assemble anything as it comes complete with every necessary item. It features a 5-gallon bucket which carries a 6-inch net pot lid. The bucket acts as the reservoir where you store the nutrient solution. This solution has a high impact on the plant by facilitating excellent root growth. 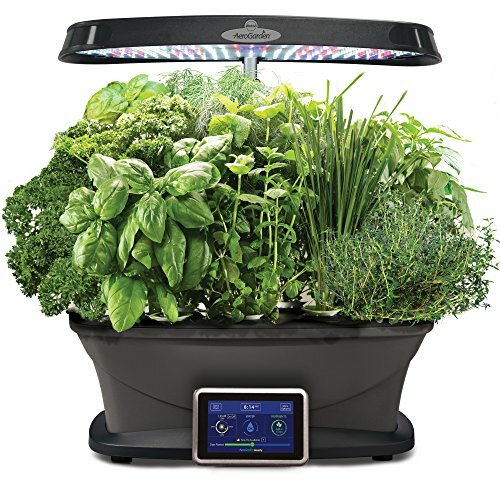 It includes a 44GPH Air Pump to ensure your plants have enough supply of fresh air. This pump uses electric power to operate. It also comes with the water pipes which are crucial in maintaining the pH of the solution. It’s always important that you keep the solution at the correct pH for your plant. Plus, watch for temperature changes to prevent the reservoir contents from becoming rancid. Also in the mix are Rockwool seeds as the growing medium where the seedling can start its growth. It comes with an air stone to circulate air so that your plant can grow healthy and strong in no time. The deep bucket makes it possible to grow crops with deep roots. It also has a blue water level indicator and a drain. This way, you’ll not be hassling with the net lid and risk the entry of sunshine which can lead to the growth of unhealthy bacteria. This set of six buckets each measuring 3.5 gallons is excellent when you want to grow a larger number of crops than with only one humungous bucket. The Bubble Brothers understand that most hydroponics have a shallow root system that’s why the capacity is also small. It uses top quality clay pebbles as the growing medium. You’ll get your supply of a 10liter bag of clay pebbles, so you won’t go out looking for more for some time. It also achieves very high bubbling thanks to the 2-inch air stones. The system creates a clear balance between the supplies and the plant to ensure it gets everything it needs including the plant nutrients. As with any other hydroponics, you should watch for the pH. More so in this design, you want to be careful about disease control since it can quickly spread to the other plants. The best thing about the Bubble Brothers is that you can expand it since you have control of how much air tubings you can use. You’ll, however, experience some high noise levels owing to the huge air pump. 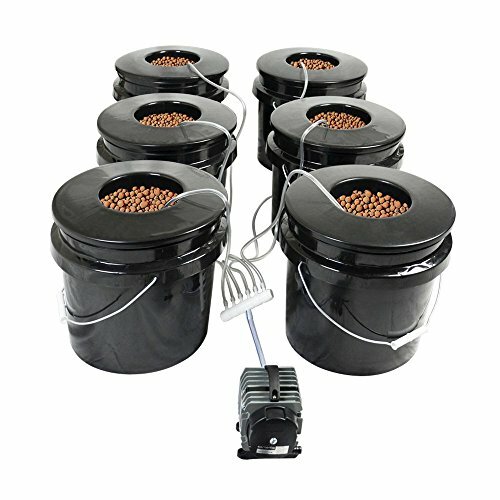 Other than that, this is a system to consider for those with small-sized grow spaces and probably the best hydroponic system. You’ll mostly find the names flood and drain attached to this kind of design. From the title, you can tell there’s some sought of flooding which takes place. This method uses a nutrient tray which does not link directly to the plants. Tubes are controlled by timers to open at scheduled times to supply the plant with the water and nutrients. The air pump s a little noisy, but it is very powerful. Instead of using the conventional drain tables to facilitate the flooding process, the Hydrofarm system uses a small reservoir which does not rely on gravity. You still get to control the flooding times using controlled intervals. 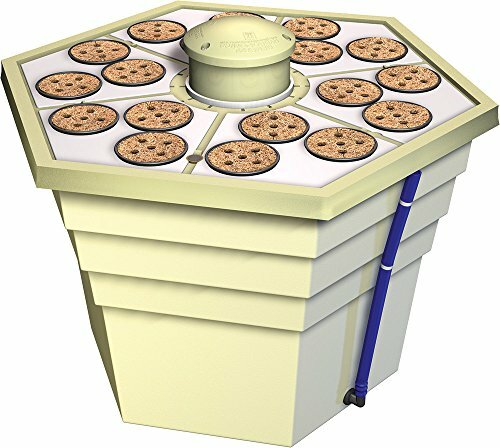 This system comes with 12 pots which can be expanded to 48 but still use the 55gallon reservoir. It comes with a controller which can handle heavy usage. It is protected against flooding with an auto-shut-off valve which closes upon the detection of excess flow. You’ll love working with it since you don’t have to be around to feed your plants. You only have to set when the reservoir fills and drains, and all work is left to the controller. Not forgetting, Hydrofarm supplies you with the best hydroponic nutrients including FloraGro, FloraMicro, and FloraBloo. These nutrients are vital to support the growth of your plants by providing both neutral and secondary nutrients. The Flora series nutrients make the best for both soil and hydroponic plants since they are pH balanced and offer essential oils, aroma, and potency to a wide array of plants. To say the least, this system suits beginners and professionals since it comes small but is expandable to fit future needs and thats why it is considered by many the best hydroponic system out there. It does not need a lot of attention after it is assembled. It comes with a controller that controls the pumping and control functions. The instruction book is not very specific. There is always standing water. When you have limited space but still want to nurture some plants, this minimalistic system by Viagrow works perfectly. 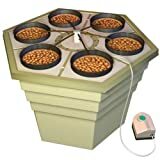 First, it can hold 16plants in 1gallon nursery pots. It comes with a 50-liter bag of Viagrow rocks. They are designed to provide a growing medium which provides an optimum flow of air. The timer is grounded in the elements and it provides precise intervals for when you need to flood or drain water and nutrients. Looking at the air tubing, it is a GPH submersible pipe designed by Viagrow. It connects to the timer such that after you set it, the whole system becomes automated. The tray table is FDA approved as food-grade so you should not worry about what’s passing to your plants. What’s more, the tubes have a filter to ensure your crops are getting the highest water quality. This system is effortless when it comes to setting it up. The tray which sits on steel frames is sturdy to support the 16 pots from the time the plants grow from one phase to the next. You’ll love that it takes just a little space but supports a decent number of plants. This method is another simple way to your hydroponics which does not use soil and suspends the plants in the air. The system works by spraying the root zone. Here, you skip the long tubes while plants receive the nutrients directly from the reservoir. It is sophisticated and yet very effective. You can reuse your nutrient solution. Requires very few parts to make up the system. You may run into a height restriction with the plants because of the height of the reservoir and tray. Mineral build up can cause a nutrient lockout, which can also cause a nutrient deficiency. This system is the best example of Aeroponics. It is synonymous with indoor gardening since it is a compact unit which comes in the form of a countertop. It carries up to nine pods where you can grow fresh fruits and vegetables right there in your house. 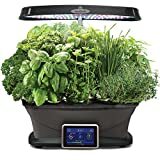 The uniqueness of this system is in that it comes with the grow light which exudes 45W of natural sunshine lighting. With it, your plants get a constant supply of the nutrients they need thanks to the digital controller which reminds you of the times to feed your crops. You’ll know when to add water, and it also controls the grow light. You can expect the best yields, owing to the high performance of the system which maximizes the photosynthesis process. The plants in this hydroponics grow up to five times faster than they would on the soil. What’s more, you have a full supply of nine pods which can fulfill an entire season of grocery supplies. This includes mint, Thai Basil, thyme, Italian parsley, curly parsley, chives, dill, and two pods of Genovese basil. You also get a supply of 3.oz nutrients. Your plants will never lack meaning they’ll be vibrant and your harvest will be plenty. With a larger footprint, the plants can grow freely, saving you from the trouble of cutting branches and leaves daily. Salads and herbs grow quite rapidly and are full of flavor. Nine pods seem too much as more or less you will be using 6-7 pods at a time. A bit heavy which makes adding water and cleaning slightly inconvenient. The Rainforest by General Hydroponics also uses the same idea which suspends plants in the air. In this model, you get a kit which can hold up to 18 small plants or 90 cuttings. The plants are suspended in plastic containers with a growing medium which measures only 6inches wide. It is quite small that’s why most people prefer it as a starter kit before transferring the plants to larger systems. The Rainforest Aeroponic system comes with a 3-part flora kit. It has the nutrients to feed your plants to maturity. The net cups have CocoTek liners which carry clay pebbles. It also comes with a pumping column to complete the connection from the cups to the reservoir. It is perfect for beginners who need everything in one place. This kit comes with a 13-gallon reservoir and a vortex sprayer. The sprayer first oxygenates the nutrient solution before spraying the root zone. It ensures there’s maximum supply of air to the plant which gets it to grow faster and stronger in a short time. An air pump is included and is an important entity to facilitate the aeration. After your plants have reached a certain stage, they’ll need transferring to a larger space to prevent stunted growth. This type of hydroponics is quite common in both small and commercial setups. It can be manipulated to hold many plants as compared to other systems. It uses a pipe which drips water and the nutrient solution on to the plant and roots. The medium should be highly absorbent to prevent flooding. The most common challenge faced by this method is the clogging. That’s why it needs constant care. All in all, there’s always a timer which can control your feeding and watering times. This module comes with one pot which can hold closely packed plants. It does not compromise on how far a plant can grow since one chamber has a 2-gallon capacity. It requires crops with shallow root systems so that you’ll not need to do another transfer later on before maturity. The Waterfarm gallon is top quality and is supplied with the nutrients to kick off your hydroponics gardening. This system features a watering system which includes pipes that connect the reservoir to the growing chamber. The exterior pipe is in direct contact with the interior tube which supplies the nutrients and water. It also comes with a drain to remove the excess and guide it back to the reservoir. You’ll love that it is supplied with an air pump and the air tubing. The set is straightforward to assemble seeing that the instructions are well-written. Waterfarm also includes the clay pellets and an airstone. The clay pellets are made to be highly absorbent so you should not have trouble with flooding. With the air stone, your plants will have enough air, and your yields are bound to increase. In a drip set up, it’s always useful to watch for the pH if you are using a recirculating system. The fluctuating acidity can affect your plants immensely. Nevertheless, this is a reliable choice of hydroponics for small-scale indoor or outdoor gardening. Your large plants are not left out since the EcoGrower got you covered. It is much bigger than the one-bucket module since you can grow six plants in the six growing sites. The buckets each measure one gallon which mean they can handle big plants without hassle. 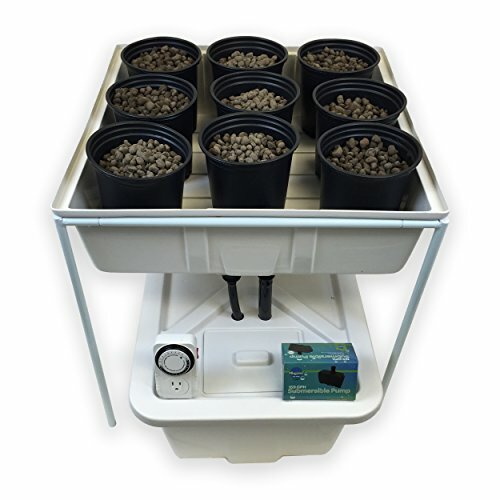 You’ll love that even though it can take six plants; the whole unit only takes a 2x2ft space. It is best for people who live in apartments or homes with small growing spaces. The 17-gallon reservoir is enough to supply your plants with the nutrients they need. It comes with the flora nutrients plus net pots with CocoTek Liners. The system uses clay pellets for the growing medium to counter flooding. It also explores a spider drip system which uses a set of drip pipes that are air driven. There’s an Elite 800 air pump to ensure there’s enough air supply. It is not as noisy as you would expect with such a hydroponic system. It is easy to set up and use since after the initial assembly you can grow several other plants without disassembling the top. The CocoTeK liners and net pots are removable so that you change the clay pellets and keep out moss and harmful bacteria. Provides everything you need to get started in hydroponics except for the seeds and conductivity testing kit. This is a proven product from a well-established company. This system is easier to manage and maintain than many competing systems. Watch the water temperature that it does not go below 60-degrees or higher than 70-degrees. This is crucial because at high temperatures oxygen supply is cut which increases the occurrence of root rot. And, most plants cannot survive in low temperatures. Keep tabs on the quality of water by measuring the PPM (mass of chemical per unit volume of water). The ideal PPM rate for water should stand at 0-50 before you add in the nutrients. Use a digital pH tester to know the correct level. Always do it every day at certain times so that you can have a clear record. It’s always important that you know the right pH for your particular plant to be able to manage the reservoir. All plants thrive in a pH level between 5.5 and 6.8. Always add solutions (water or fertilizer) which will get the reservoir pH to stick between these levels. Use an air pump that supplies Co2 since plants deplete Co2 much faster when they are in the flowering stage. And, do not forget to keep the air temperature at around 80degrees F.
Apart from nutrients, you should also supplement your crops with important additives like Thrive Alive B1vitamin, nutrient supplements, and even plant hormones. Maxicrop seaweed supplement is highly recommended as it is known to counter root rot in vegetables. Hydroponic systems do well outdoors when exposed to real sunshine. However, you should cover the reservoir when it rains to avoid neutralizing the solution. For those that grow indoors, invest in a high-quality grow light. Use timers to control the light output and spectrum at all times. Last but not least, always change your reservoir solution every two weeks. This way, you’ll keep it from being rancid. There are three crucial elements which must be present in your system to prevent the breakout of disease. There are two causes of disease which are mainly parasitic diseases and those resulting from the plant’s environment. You might think that plants grown indoors are resistant to pest, but this is not always the case. 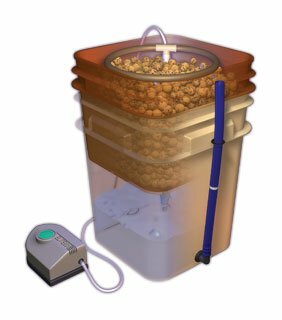 Pest Management– this is simply done by filtering the air and minimizing the people who access the grow space. Use pest and disease products to prevent their occurrence before it even happens. Disinfect the water you’ll be using in the reservoir. Take your time to do either reverse osmosis for tap water or treat your water supply if it’s coming from the surface like a swamp or dam. Proper drainage– a clogged drainage attracts pests which love being in the water and fungal infections. Make sure your hydroponic system has a method of managing floods. Get to know about the disease you are dealing with before you apply any form of countermeasure. If it is root rot, for example, there are some steps you can undertake. Also known as Pythium, root rot disease is a common occurrence in hydroponic systems. It is categorized by decomposing roots which are usually sludgy and turn color to brown. More so, it thrives when the nutrient solution temperature is high in the presence of low oxygen. How does root rot transfer to your plants? Just like communicable diseases, root rot is known to infect plants through a medium. It can be the nutrient solution, grow medium, water, your shoes or even your clothes can carry the disease-causing element from another grow space. The best way to be sure you’ll not encounter root rot is by maintaining the correct temperatures in your nutrient solution. It’s always good if you could get it to be insulated so that temperatures may not rise above optimum. Between 18-20degrees Celsius is the ideal for hydroponic systems. Change the nutrient solution frequently. The longest it should go in two weeks. One week is most ideal. Finally, always wash your gardening equipment after every harvest and before you bring in a new batch of plants. A small space should not keep you from enjoying the perks that come with having fresh grocery supplies. With our help, you can now build your own best hydroponic system that brings high yields in an environment-friendly garden. You get to have it easy since you’ll not be dealing with dirt. It is a smart choice, so join in! i hope you liked our review about the best hydroponic system.